In the east valley, where the last of the nine contiguous incorporated CV cities bend south away from the Interstate, toward the unincorporated communities and the Salton Sea, two longtime neighbors, Indio and Coachella, are linked together like a puzzle piece — segments interlock and reach into one another‘s sphere of influence and space. In July, the Indio City Attorney’s office filed a Petition for Writ of Mandate and a Complaint for Declaratory and Injunctive Relief in reference to The Lighthouse, a retail business that sells recreational marijuana located on Avenue 48 and Van Buren Street in the City of Coachella. The City of Indio does not allow the commercial sale, cultivation or any cannabis related businesses. But, what if there is a cannabis business right on your back doorstep? The Lighthouse is a stone’s throw to Indio’s industrial zone and blocks away from Indio residential neighborhoods, and this has generated litigation between the good neighbors of Indio and Coachella. In a press release, Indio stated that the location of The Lighthouse dispensary is within close proximity of Martin Van Buren Elementary School, the Coachella Valley Rescue Mission, rental housing provided by the Coachella Valley Housing Coalition that includes farmworker housing, and Desert Gardens a multi-family residential community all within Indio’s city limits — just outside the tessellated boundary with Coachella. Dissected maps and the burgeoning California cannabis industry have created new challenges for communities as they try to minimize “negative” impacts and retain quality of life. Indio acknowledged that it did not make the decision to move toward litigation lightly and recognizes the right of every city to exercise local control over land use and marijuana sales. The City of Indio sent four letters beginning in March to the City of Coachella detailing Indio’s proximity concerns for a retail cannabis dispensary along with other land use issues that could potentially impact Indio and its residents. City representatives wouldn’t comment on the litigation. The Coachella Valley is known globally because of the popularity and prestige of The Coachella Music and Arts Festival. Most fest goers do not know where Indio ends and Coachella begins. Some believe “Coachella Fest” is actually within the City of Coachella, instead of Indio. According to the Coachella Valley Economic Partnership and Greater Palm Springs Convention and Visitors Bureau the overall economic activity generated by the back-to-back Coachella Festivals and Stagecoach is over $700 million. Money injected into Indio’s economy is estimated at over $100 million. Indio’s tax revenue — just from ticket sales alone — is over $3 million. With revenue like that, why bother with the cannabis industry to help fill the city coffers? Of the nine CV cities, the City of Coachella gains the least during the festival season. Currently, Coachella has no hotels or accommodations that make any significant contribution in tax revenue. It is primarily an agriculture community with 70 percent of its land still undeveloped! The Lighthouse Dispensary is a clean, customized, modern Quonset hut. The semicircular structure is situated on a .29-acre lot that is part of the mixed-use Glenroy Resort development project located on 35 acres bounded by Avenue 48 on the north, Dillon Road on the east, Ed Mitchell Drive and the Rancho Las Flores Park on the south and Van Buren to the west. The Glenroy Resort development consists of 130 single story resort bungalows with a total of 624 rooms; an 8,050 square foot conference center; a 12,000 square foot office, gym and food service building with an indoor entertainment area; a four-story 130-room hotel; a restaurant, general store and coffee shop. All within a few miles of the Empire Polo Grounds – the home of Coachella Fest and Stagecoach! Phase one of the Glenroy Resort project is underway with 77 bungalows and five commercial buildings under construction. They expect to open in early 2019. When the project is completed, it is expected to generate over 300 permanent jobs and $1.2 million in annual tax revenue for the City of Coachella! The Glenroy Resort is located on land that was originally part of a 160-acre single-family residential subdivision known as “Rancho Las Flores.” The existing Rancho Las Flores residential community on Avenue 49 was the first of six phases that went into default in the early 2000’s. In 2006, the city purchased a 32-acre portion of this land to build the Rancho Las Flores Park. Filed July 24 at the Superior Court of the State of California, County of Riverside, Palm Springs Branch, the petition is City of Indio verses the City of Coachella with Real Parties in Interest the Coachella Lighthouse, and Glenroy Coachella, both Limited Liability Corporations. Indio’s lawsuit challenges a number of actions taken by the City of Coachella to permit the temporary and permanent operations of The Lighthouse Dispensary without following the statutory process for issuing entitlements. 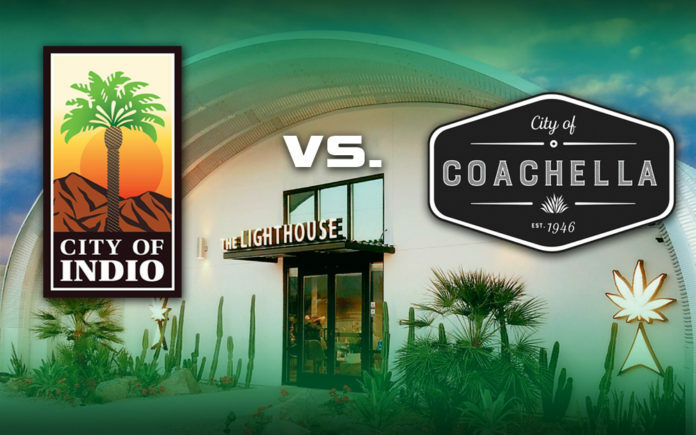 In a nutshell, Indio alleges that Coachella’s Planning Commission did not hold public hearings and acted outside city ordinances and requirements and made recommendations that were adopted by the Coachella City Council without compliance of applicable laws, thus rendering their actions invalid regarding The Lighthouse’s location and operation. Keeping with its agriculture and manufacturing history, the City of Coachella permits the cultivation, extraction and distribution of cannabis in industrial zoned areas. In February, the City of Coachella passed ordinances allowing retail cannabis and microbusinesses in restricted areas of the city. Besides The Lighthouse, the city will issue three retail cannabis licenses that will be permitted in the downtown Coachella “Pueblo Viejo” district. The Lighthouse Dispensary was issued a “special event permit” allowing the lighthouse to operate during the month of April for the Goldenvoice music festivals, and during the first week of May for “Cinco de Mayo” festivities. The Lighthouse was closed and did not sell cannabis during the last three weeks of May 2018. The dispensary re-opened as a permanent retail cannabis establishment on June 8, 2018. The Lighthouse Dispensary maintains a current Temporary License with the State of California’s Bureau of Cannabis Control. It seems inevitable that these neighbors will soon be side-by-side in court.